It's a little over a year after African pop singer 2face Idibia romantically proposed to longtime girlfriend and baby mama Annie Macaulay and less than a year, since they secretly got married. No more surprises though – the couple who announced they will be throwing a big wedding this March lived up to their word by travelling all the way to Akwa Ibom for their traditional wedding. Little Eket Community in Akwa-Ibom received a host of celebrities last weekend as the love birds 2face and Annie had their star-studded traditional wedding. Celebs guests included best buddy Sound Sultan, Nollywood actress Kate Henshaw and Ini Edo, HipHopWorld Magazine boss Ayo Animashaun, Now Muzik's Efe Omorogbe and Tony Anifite, Timaya, Iyanya and more. Most guests stayed at the Villa Marina hotel, especially those who arrived the night before. The pre-wedding bash also held a night to the wedding, and all that we are told was sponsored by the governor of Akwa Ibom state Godswill Akpabio. Final preparations are being made for the grand white wedding taking place in Dubai, later this month. 2face's former band mates Blackface and Faze were surprisingly missing from the pop singer's Traditional wedding with his bride Annie. Despite going their solo ways in 2004, 2face has remained good friends with them and featured them in his 2012 album concert. Some of the big names that did make the trip include actresses Kate Henshaw, Ini Edo, Sound Sultan, AY Comedian, and Iyanya. 2face ditched his conventional jeans and shirt for a more cultural look at the wedding. The pop icon was spotted wearing a white long sleeve linen shirt over a brown wrapper. He accessorized with locally made beads as his necklace and hand chain. He even took it a step further by customizing his brown cap with the inscription '2 Baba' written on both sides. There was a last minute rush for invitation cards as the buzz grew bigger when the official IV and pre-wedding photos hit the web. The Macaulays' hometown Eket came alive as the celebrity couple – their daughter Annie and groom 2face arrived for one of the biggest wedding ceremonies there in the last decade. Eket is situated 52KM away from the State's capital Uyo and takes an average drive of 54 minutes to get there. The wedding took place at the Apostolic High School, Esit Urua Community, Eket-Ibeno Road. 2face's ever cheerful 'best-friend' and music collaborator Sound Sultan played the important role of Best Man at the wedding. It would have been surprising if he had chosen another friend. Iyanya turned out to be the saviour of the day; it was the 'Kukere' pop singer that flew in from Lagos to Eket with 2face's wedding outfit. Apparently, the tailor had been running late with the sewing and quickly handed it to Iyanya to drop it off. Crisis averted. Nigerian events rarely start early and this one was no exception. All the guests had arrived early enough to see the bride and groom in all their glory but had to wait five long hours before the ceremony kicked off. Apparently 2face's wedding outfit had not been ready all this while until the last minute. No bachelors' party for 2face! Everybody including the bride partied hard at a local night club in Uyo. The gig was sponsored by the state governor who also hosted guests to a post-wedding dinner at his official residence, Saturday night. The Akwa Ibom State governor reportedly announced he would be donating two brand new Toyota Prado SUVs. He promised to send a 29-man delegation to Dubai whose trip will be sponsored by the State. He also promised to rehabilitate the Eket-Ibeno road before the next child dedication ceremony of the couple. 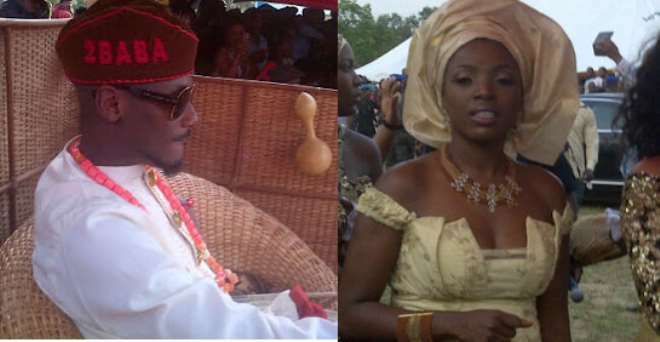 There was a bit of tension when the couple and family heard the news of 2face's baby mama/Off-on lover Pero Adeniyi (who is now based in the US with her three kids) flying back into Nigeria this Idibia wedding season. Pure coincidence? (She didn't make it to Eket, BTW).